Phil Mickelson reflects on a record-equalling fifth AT&T Pebble Beach Pro-Am and praises Paul Casey's decision to take the tournament to a fifth day. Report and highlights from the final round of the AT&T Pebble Beach Pro-Am. The American closed out a bogey-free 65 to finish on 19 under and finish off a three-shot win in California, as Casey made a final-hole birdie to grab outright second ahead of Scott Stallings. Mickelson was visibly disappointed not to finish in near-darkness on Sunday evening as Casey refused to play on, leaving him having to return a day later to complete his final two holes, although now accepts the Englishman's decision. 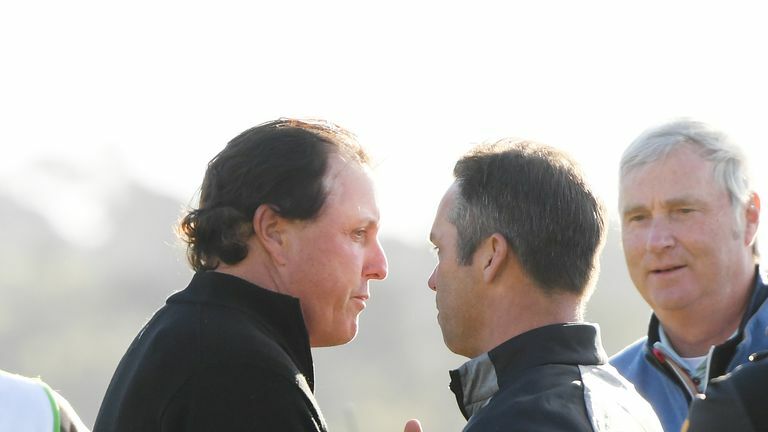 "It was the right decision and Paul [Casey] made the tough call, but it was the right decision in that he protected himself and myself for the competition," Mickelson said. "We would have been at a severe disadvantage last night where you can't see the targets and the greens were pretty rough. This morning we came out and the greens were much better. "It worked out really well for us both and he made that tough call. Sometimes I just get in my own little bubble and I don't see the big picture and I just wanted to finish. "I was playing well and I just didn't take all the factors into account. So I ended up thanking him this morning for making that tough call because I made it tougher for him and but he did the right thing in protecting both of us." Casey took a three-shot lead into the final round but ends the week three strokes back after a one-under 71, with the two-time PGA Tour winner finding plenty of positives heading into this week's Genesis Open. "It has been a treat this week," Casey said. "I got an upfront close look at Phil [Mickelson] shooting a great round of golf and winning this golf event. I'm happy with the way I played. "I did a lot of work in the two weeks that I had off and it showed almost instantly and I'm already playing some good stuff. "I've written down a goal of winning L.A (the Genesis Open) and I had a very good chance of winning this one."